Does FISMA compliance create secure IT systems? Some departments’ information technology security grades went from dismal to decent in 2005, according to the latest IT security data collected by the Office of Management and Budget. Following a poor showing in previous years, the Department of Veterans Affairs, for example, received good marks for achieving 100 percent compliance with federal IT security certification and accreditation policies. But after five years in which federal agencies have been graded on their compliance with IT security policies, some former federal security officials question the meaning of the annual security grades. “High grades could mean a lot of compliance but not necessarily a lot of security,” said Bruce Brody, vice president of information security at Input, a market research firm. OMB, which ensures agencies’ compliance with FISMA, reported that 85 percent of federal agencies and departments met FISMA’s certification and accreditation requirements in fiscal 2005. OMB sees progress in the new figures. In fiscal 2002, only 47 percent of federal agencies complied with those requirements. Aware of the costs of FISMA reporting, OMB officials have taken steps to save money by investigating whether compliance reporting could be consolidated. 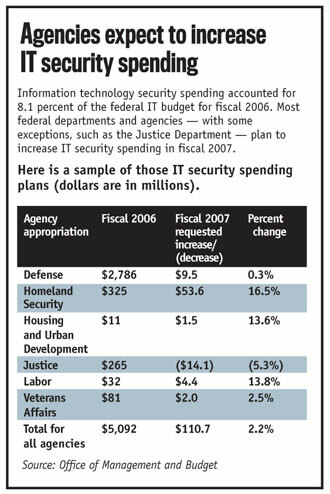 McNulty said information security programs at most U.S. businesses require far less paperwork than federal agencies do. But important similarities exist, he added. In businesses and federal agencies, chief information security officers “are fighting for resources, fighting for management attention and management support,” he said. In some companies, the role of the chief information security officer is evolving as CISOs become risk managers and, in some cases, report to their company’s chief financial officer instead of the chief information officer. But that evolution is not as likely to occur any time soon in the federal government, simply because FISMA requires the senior agency information security officer to report to the CIO, McNulty said. “By writing it into the statute, we’re locked into place, and it would require an act of Congress to change that relationship,” he added.